Antique style Leaf Necklace and Earrings Set. Silver tone with 20″ adjustable chain, metallic pink and silver leaf colors. Antique style Leaf Necklace and Earrings Set. 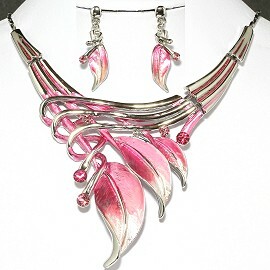 Silver tone with 20″ adjustable chain, metallic pink and silver leaf colors. The set comes boxed.